The Bob Rose Golf Scramble - Sold out! Click to download our Scramble Sponsorship brochure. Friday, April 12th, 2019 at 12:30 p.m. The Arc once again has sold out its biggest fundraiser of the year - the Bob Rose Golf Scramble. This year's event tees off Friday April 12th, 12:30 p.m. at the beautiful Plantation Golf & CC. David's BBQ will provide a delicious lunch prior to the golf, and Wahoo Seafood will welcome golfers off the course with a good old fashioned seafood boil. Of course, each golfer receives a goody bag loaded with neat stuff, and a complimentary Arc of Alachua County polo shirt. 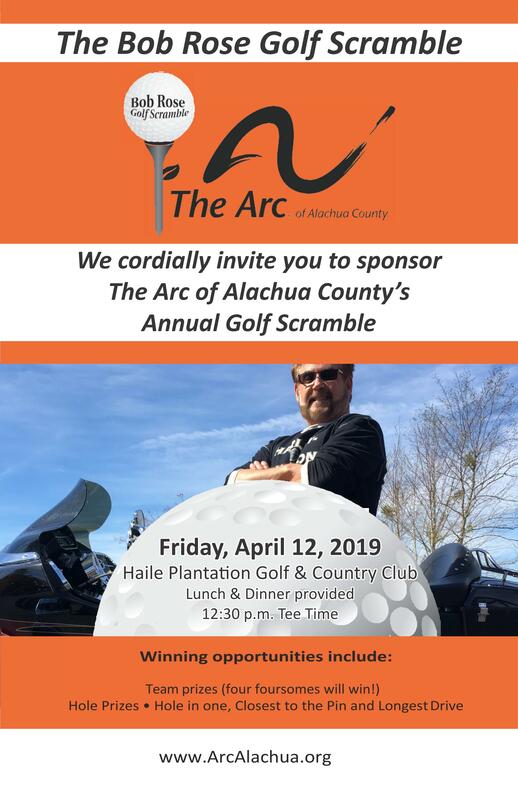 Roughly 40 sponsors and vendors and 100 golfers have contributed time, resources and cash to make this event the biggest fundraiser for The Arc. The event concludes with a Silent Auction of some neat prizes and, as always, a Live Auction of the libation-loaded 'Wheel Barrel of Heaven' at roughly 6 or 6:15 p.m.